"It's the multiplication of brains and [all] the people that you have to tune to make sure that they are all dreaming in the same direction." 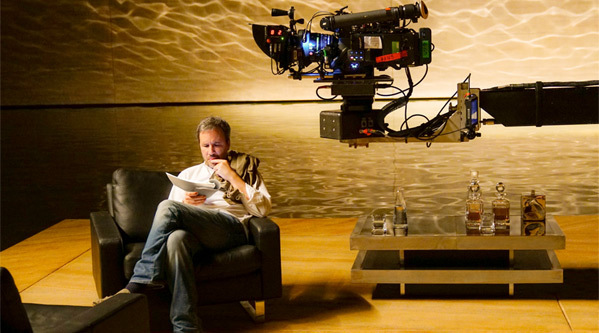 He's a master filmmaker and continues to deliver some of the best films of this decade - Denis Villeneuve. Born in Quebec, Villeneuve has been an acclaimed filmmaker for many years but finally got his foot into Hollywood's door after making Incendies in 2010. He followed that up with Prisoners, as well as Enemy released the same year, before making Sicario and Arrival. 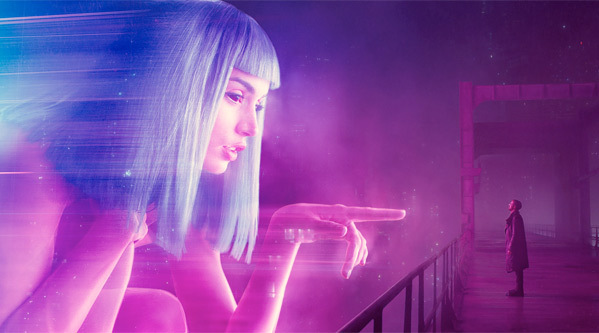 His latest is Blade Runner 2049, a highly anticipated, long-awaited sequel to the sci-fi cult hit from 1982 starring Harrison Ford as a cop named Deckard. I didn't get to chat with Villeneuve for Arrival last year (it was one of my favorite films), so I chased him this time for Blade Runner and got to spend a few minutes talking with him. This interview is completely spoiler free. I hope to get even more time talking with Denis in the future about sci-fi and Blade Runner and Arrival and all of his movies, he's one of my favorite filmmakers working now. This interview is just a quick chat with Denis and covers a few topics related to the sequel - mostly how beautiful it looks, working with cinematographer Roger Deakins, building practical sets, and taking on the daunting challenge of delivering something that lives up to the original (since it's so highly regarded as a seminal sci-fi classic). I'm also glad I could catch Denis at the beginning of his press tour, before traveling all over the world and being asked endless questions. He's a very talented filmmaker, and was wonderful to talk with, engaging me with a fascinating and honest discussion about his own processes for making movies. Denis Villeneuve: Oh yeah, definitely. Did that success give you a confidence boost working on Blade Runner because you were in the middle of it? Denis: It was a strange experience because it was like I had dreamed the experience of Arrival. I mean, what I'm saying is… the process was so intense to shoot and do the post-production on Arrival and to jump and to start Blade Runner as I was doing the post on Arrival. And when the movie came out, I was very far away. And it felt like a dream, because I was shooting a movie and there was the release of the other movie. I was kind of strangely disconnected. So it's like, if I had been pregnant with a movie, but it never came out. I'm still like, yeah I made Arrival, okay. That's true… How can I say? I wasn't there… I was totally engulfed by Blade Runner. It was a relief for me that Arrival had been welcomed. So then I'll ask instead - what did give you confidence on Blade Runner? Was there something or someone that made you feel like you could tackle this huge task? Denis: The only person — honestly, I'll sound narcissistic — but the only person I could rely on at the end of the day when I decided to say yes [was me]. I had to go deep inside me and say, okay, are you able to do this? Are you ready — first, to unmoor the task, because on paper it was not a little thing, and after that, am I ready to have the responsibility of this in front of film lovers. [But] I will deal with that after… So once I made peace with that, I was okay. You cannot rely on anybody else, I will say. Once I did that, [screenwriter] Hampton Fancher was someone that really took care of me at the beginning. I felt I had a nice meeting with him in New York. And it was really encouraging and really, giving me clues how to crack the beast. And that was like, strangely, a spark at the beginning that helped me a lot. Very simply. Denis: I think that one… Arrival, okay, to answer the question, the problem with Arrival — I didn't have the time to make peace with the movie. When you make a movie, you see your wins and your losses, I mean, you see the strength, what you improved, and the weaknesses of the project. And you have to make peace with the adventure, with the pressure… And I didn't have the time for that with Arrival. That's why I'm saying I'm feeling disconnected because I didn't have… like this one right now, I had time to go back home even for few days, go back, start to digest, start to talk about it with people, to start to understand what happened, to slowly — I don't have a lot of distance [yet] — but slowly start to see the movie for itself, which I didn't have the time for Arrival at all. So it's a strange thing. That makes sense. What was the most important thing to get right on Blade Runner? Was it the whole picture or was there something specifically you needed to make sure was perfect? Bring the same kind of poetry over to this one? Denis: Yeah. It sounds simple, but the story in this one is a bit more complex. The rhythm is a bit more, it's a higher rhythm. There's [many] more characters. And I wanted to make sure that we will stay in contact with the ambiences, the atmospheres, and the melancholia. I repeat this word very often. It's a thing that in the first movie struck me so much. And that yeah, that's what I will say that was a challenge for me to make sure is in every shot in Blade Runner 2049. From what I've been reading, so much of this was made with real, practical sets. Like how the scene with her giant hologram was an actual set filled with fog and a projector. Denis: It was very impressive because from the start with Roger Deakins, we said, okay, let's do it the old fashioned way. Let's try to, for us first because as a filmmaker we need to see real, it's a thing to be together. So you see the impact of those books on us right now? Denis: And if it was greenscreens and I said, there are books, you don't [feel it]. See it's not the same thing. And for actors it has an impact. A huge impact on them. Because they have just to focus on their inner self… On the "interior-ity" instead of having to imagine what is [around them], they don't think about the books. They think about the relationship between us, not that they have to figure out [what's around them]. Do you understand? 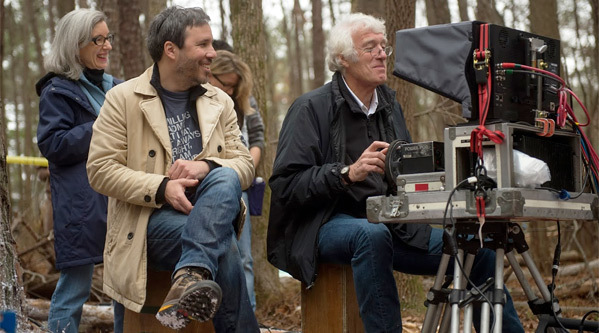 So from the start with this, Roger [Deakins] wanted to make great excitement. He wanted to have full control over the lights. Meaning that if you have a character standing in a street in the rain, with fog, we will make sure that we construct most of the street with most of the buildings and the light will be practical. And there will be real rain. And if there is a giant hologram, we brought on set, like a gigantic… I don't remember the size of the screen, this was like 45 feet or something. It was massive, like several floors, a gigantic screen. The biggest screens on Earth. And then we were showing on them this the image of Ana de Armas. Just on set, it was mesmerizing. Denis: And the thing is, the way that Roger used that, the idea was that the light would be perfect because what will be coming out of this gigantic image will light Ryan and the atmosphere on him in a very, very, very specific way. That can't be reproduced by computer. The computers, they are very powerful but there's a limit to them. Roger is so precise with light, you know? Nature of light. Even in an impressionistic world where he's designed a logic of it all. He's still very, very precise and he wants it to be totally accurate. We had a scene in an apartment… So we will do the apartment, design the apartment, construct the apartment for 360 degrees. And outside of the windows we will build things outside. And behind the building, Roger will add lights to create the city lights behind so we were coming on set and you were seeing a cityscape outside with the rain and it was really magic. Honestly the actors were all like kids. It was a really, yeah. In the footage we saw, it was mesmerizing because a lot of the light is moving in every single shot. It feels like you were almost keeping pace and progressing every scene with the lighting. Denis: Yeah. It's a thing I said to Roger right at the beginning. I said, listen, you're bound to naturalism in the movies you have done so far, now you can go wild and you can do anything you want. You don't have to justify. And what the moves means are that Roger took a lot of liberties. But even there I was seeing him working and it needed to be logic. Even when lights [go by], it needed to be, for him, a Spinner passing by. It needed to be a subway train passing by. It needed to always have a logic, and to control that logic and the rhythm of lights. It was really beautiful to see him working. How, with so many people involved, can you maintain your particular vision of what you want this to be? Not only with Ridley Scott and Harrison Ford, but also with the studios? Denis: Well. Let's say first that Ridley gave me total freedom. So he didn't interfere a single second in the process. Right from the start, he said to me, "it's going to be your movie." The studio, they embraced my vision. They had a very strong crew around me and they were excited by it. So that was not tough. The tough thing that I found is that I was used to working with a certain amount of people around me — a medium-size film crew. That was like an orchestra, a chamber orchestra. Suddenly I was in a symphonic orchestra with hundreds, thousands of people to direct. And the most difficult thing is when you have prop designers that are working in another country, our vehicle designers, our VFX artists [are in another country]. And it's the multiplication of brains and the people that you have to tune to make sure that they are all dreaming in the same direction. That communication process with those people where I have intermediates, meaning I don't have a direct contact. I need to go through several people to talk to this person on the other end. That I thought was difficult to do, because that needed — to repeat a lot the same thing. And to insist, to insist, to insist until you… and I never did that [before]. I lost my virginity on this movie. Denis: I understood what it means and how prepared you need to be. And at the end I'm happy, but I'm happy because we insisted until the very last second. And you got exactly what you wanted. Denis: We got it, but honestly thanks to Roger Deakins, because I wasn't alone. He fought for [everything] with me. Big time. Denis: He's a master and he's also a pretty — how can I say? He doesn't let [anything] go. So if I say I want this this way, he was there to push with me. And for that I am grateful, yeah. Thank you to Denis Villeneuve for his time, and to 42 West for helping arrange the interview. 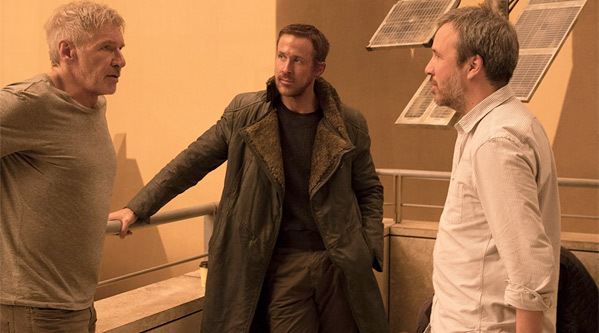 Denis Villeneuve's Blade Runner 2049 opens in theaters worldwide starting this week. This sci-fi sequel has been over 30 years in the making, and it's finally time to experience it on the big screen. See you in theaters.